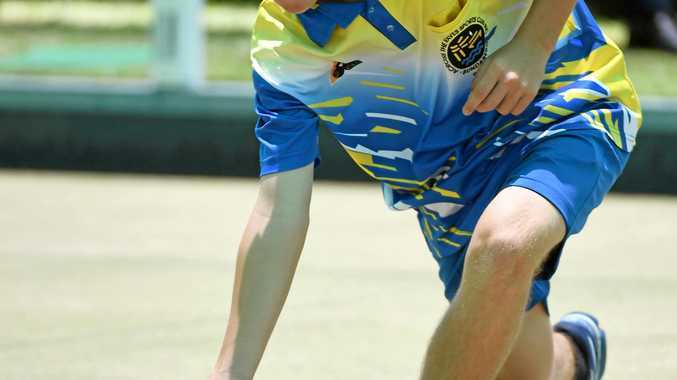 BOWLS: Bundaberg's Nick Cahill is on the verge of a special feat today at the Bowls Queensland state titles in the Rum City. The 16-year-old is two wins away from claiming all four state titles in the under-18 age group after progressing to the singles semi-finals yesterday in Bundaberg. A win in the singles would add to his pairs, triples and fours wins he got earlier in the tournament. Cahill, combining with Rebecca Rixon and Jessie Cottell, took out the triples title against Kane Nelson Shane White and Jake Rynne in a thrilling encounter on Tuesday afternoon. Locked at 16-16 after 18 ends the trio won the gold in an extra end by one point. For Cahill and Cottell it was their third gold medal with Rixon winning her second after being part of the team for the fours campaign as well. Cahill then backed up his performance yesterday with three wins in singles over Josh Collier, Matthew Todd and Zac McLeish to be on track to win all four gold medals. If he wins he will repeat what he did last year. "It's quite possible now,” he said. "There's some good competitors out there and being the reigning champion, everyone is out for you. The occasion of winning all four titles for the second straight year is not lost on Cahill either. "It would be a very good confidence booster around junior bowls,” he said. The new Across The Waves bowler, who joined the club in November from Bargara, said it had been good to play at home. "It's very hot but very good,” he said. Cahill will take on Sean Gillis in the semi-finals before facing either Shane White or Carl Flegler in the final. The finals matches will be held at both the Burnett Bowls Club and Across The Waves Bowls Club with entry free for spectators.